I am back after Summer Holidays!!!!! I was on my summer vacation for the last couple of months. I had a very good time in India attending lot of weddings. After coming back my dear friend Bharathy kept on asking why I don’t post something on the blog…and my answer was I will…it took one month for me to get over my holiday hangover!!! This being my first post in almost 3 months, I thought something sweet was appropriate. 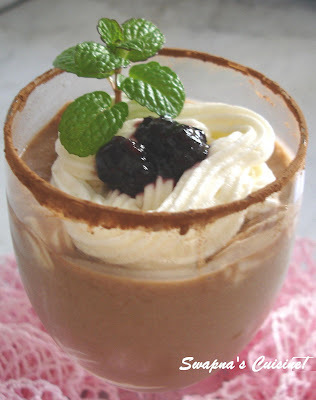 So here is the recipe for Eggless Chocolate Mousse! Mix cocoa and corn flour in 1/2 cup milk. Boil the rest of milk with sugar. Add dissolved cocoa and corn flour to the milk, stirring continuously. Cook on low heat for 3-4 minutes. Keep aside. Put 4 tbsp water in a small pan. Sprinkle gelatin on it. Heat on low flame to dissolve it. Do not boil. Mix the gelatin with the custard. Chill in the freezer till thick, but not set. Beat the thick chocolate custard. Add cream and essence and mix gently. Pour in six mousse cups. Chill in the freezer till set properly. Transfer to a shelf of the refrigerator, but 15 minutes before serving, return to the freezer. Sprinkle each cup with a little cocoa powder and powdered sugar at the time of serving. I am delighted to receive the Chat Award from Purnima of Fantasy Cooking. I am forwarding the same to my dear friend Bharathy!